Shiver me timbers! Yo, ho, ho! And a bottle of rum! We had the news a while ago about the 7th Sea license and how things played out with AEG. Well, John Wick has launched his Kickstarter campaign for a 2nd edition of the 7th Sea RPG. 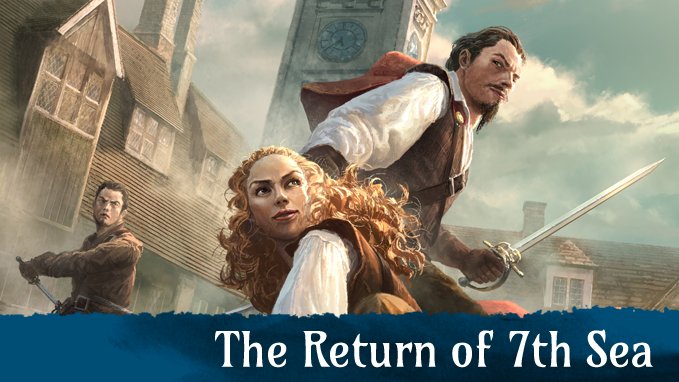 For those that don't know, 7th Sea takes inspiration from places like the Three Musketeers and The Princess Bride and brings all that swashbuckling action to your tabletop. One thing a bit different about 7th Sea is that you don't start out as a lowly just-starting adventurer. You can already be well-established as a hero and adventurer in the world, and as such, your first quests won't be to clear basements of giant rats. That means you can jump into the real action and some meaty quests right away. If you want, you can check out the Quick Start rules, as they've been posted on the game's Kickstarter page. The game's already well over their funding goal, and has made it through several stretch goals already. So this will be one to watch for the next 33 days.